Fine Line Imports is proud to release the FLI two piece rotor upgrade kit for any 2004-2009 STI (FLI Stage 2.5). This rotor kit has been perfected with many hours of hard work. 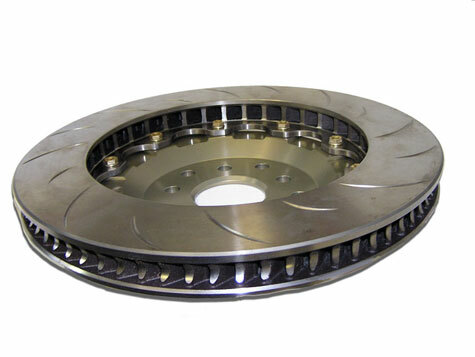 In conjunction with WR racing we have designed and tested a heavy duty two piece rotor that can not only withstand your track day abuse but also your daily driving. This high quality 72 vane slotted Brembo race rotor is matted to a CNC machined light weight hat made from 7075-T6511 aluminum. Each rotor is a little more then 5lbs less then a stock rotor and total rotor diameter has increased by 3mm (1.5 on each side). 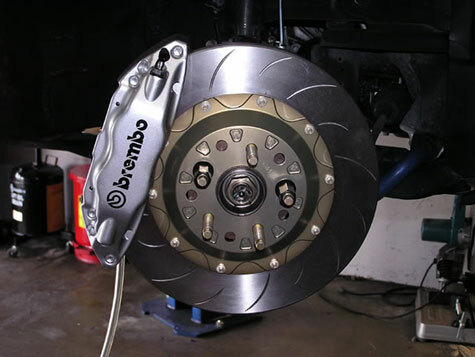 The thickness has remained the same which allows them to be used with the factory Brembo caliper. 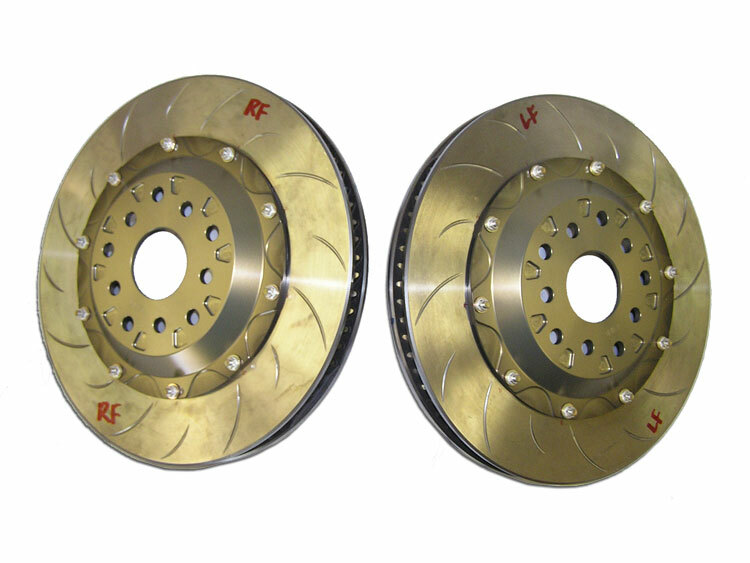 The only complicated part of using these rotors is that a modification needs to be made to the existing or new pads that will be used. On the set below we had the pads slightly cut on a waterjet in order to make enough clearance from the out side diameter of the pad in relation to the outside diameter of the rotor hat. 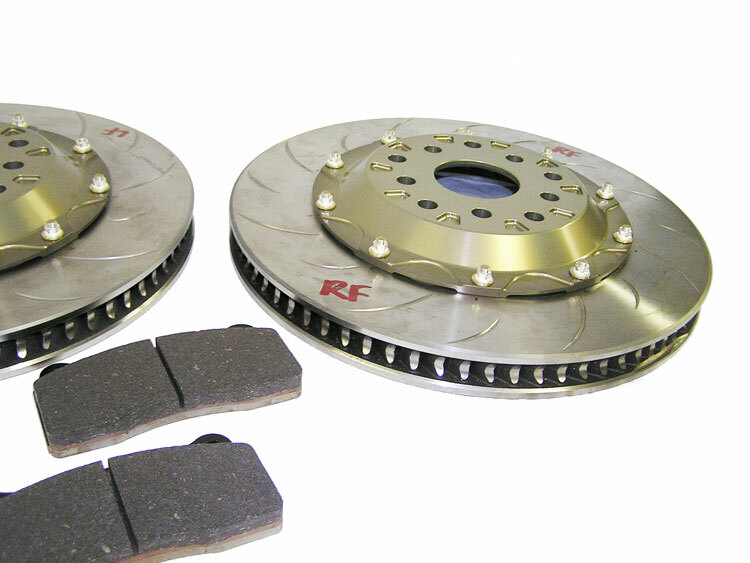 FLI will offer any Ferodo, Hawk, OEM Brembo and Pagid pads already cut with the kit. If you want to use a certain brake pad that we do not offer, then send them in and FLI will have them cut for fitment. Overall I am very happy with the way these have turned out. After performing the correct heat cycling bedding process, verification was made that there was is no clearance issues. 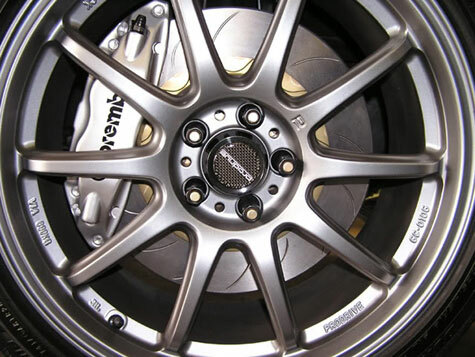 Fitment is A+ and they are drilled for both 5×100 and 5×114.3 so one rotor works for everyone with a STI or Brembo brake take offs. To visit the I-Club post visit here. 3. Weight reduction of a little over 5lb per corner. 4. Two piece design saves money when reordering rotors. 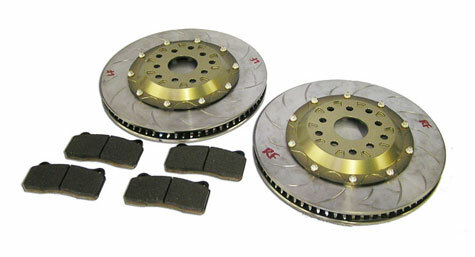 FLI is excited to offer this very high quality brake rotor/pad upgrade kit to the Subaru community for any STI car. If you have any questions please let me know. This entry was written by Ryan, posted on Friday, September 4, 2009 at 3:46 pm, filed under Ryan Speaks, Shop News. Bookmark the permalink. Follow any comments here with the RSS feed for this post. Trackbacks are closed, but you can post a comment. yes, we tried to come up with an efficient product for a reasonable price.